A new semester has brought a new group of students. Today they all took their first step into preschool class. Most were pretty timid upon walking through the door. A few tears were shed during the first hour, but they were easily assuaged with a little comforting. My philosophy with my students is to entice them out of their shell rather than push. In preparation for first day jitters, I had each parent send me a family picture ahead of time. When the children came into the classroom, they took off their coats and hung them up. Then they were told to go to the photo table and find their family. Hah! Here’s a task they could not fail. They KNEW the answer to this test! You could see visible relief on their faces as they marched themselves and “their family” over to our table to choose a seat. 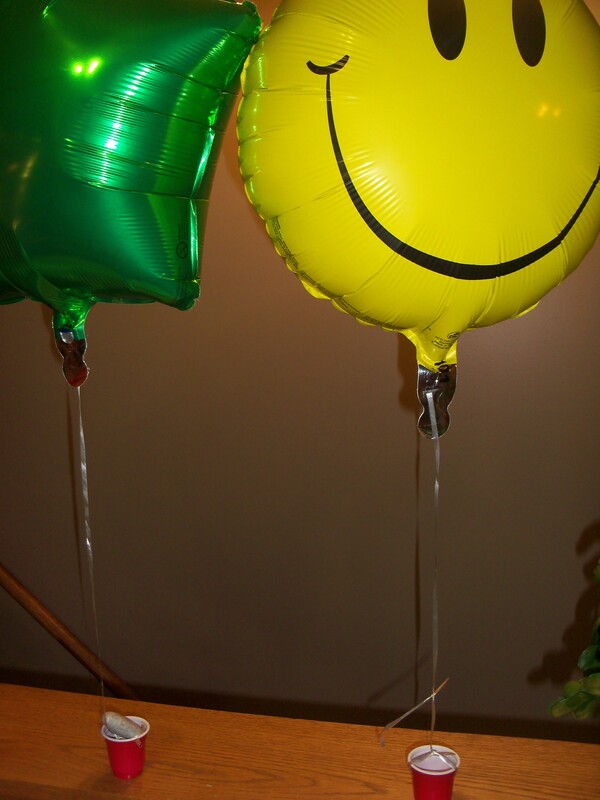 I try to have Mylar balloons for each student this first day of class. 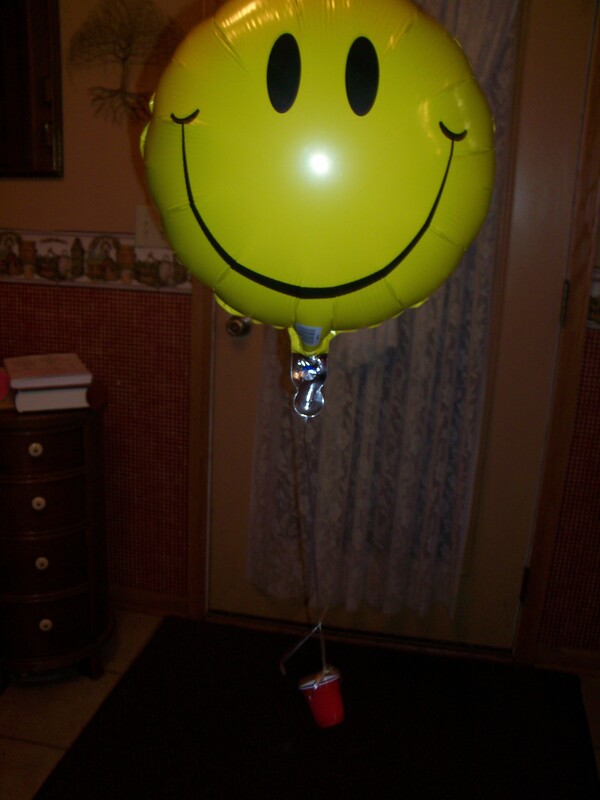 Who doesn’t love a Mylar balloon? They make the atmosphere feel fun and festive right off the bat. The students found a seat they liked, propped their family photo against their balloon’s weight and proceeded to engage in doing wooden puzzles. Very few preschoolers can resist the draw of bright wooden puzzles, but I had one today. He was particularly nervous and could not be drawn out by the lure of puzzles. Luckily, he was excited to see my shape-sorter ball on the table as well. This was a “puzzle” he could enjoy. Once all the kids had arrived and had sufficient time to explore the puzzles, we welcomed the class and went around the table with each student holding up their picture and telling us about who was in their family. We noticed that some of our students were the oldest in their family while others were the youngest. Some had both older and younger siblings. Two families had all boys and one family had all girls. I asked students to raise their hands if they had 2 kids in their family, 5 kids, etc. It was a great time to compare how our families were similar and different. After everybody got a chance to share about their family, we brought out my Snail’s Pace Race game. This is probably THE BEST preschool game around. 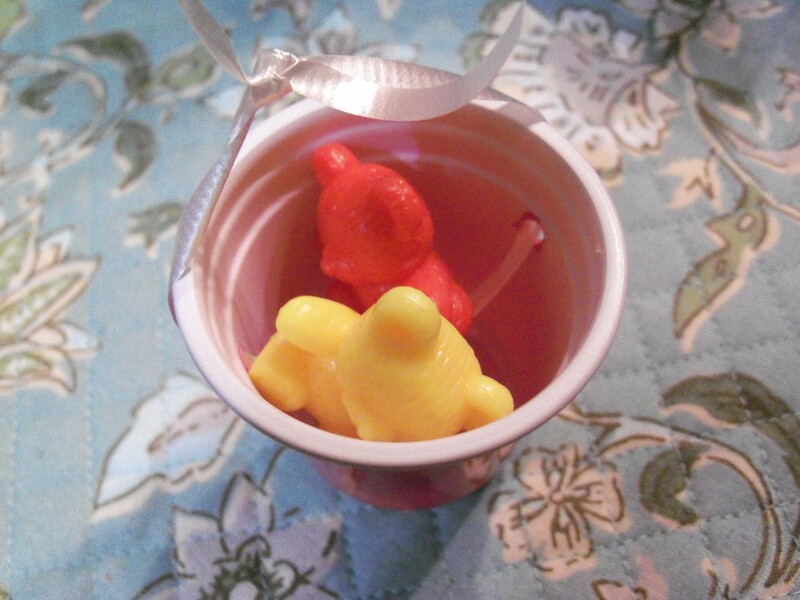 I like to think of it as a preschool version of the Kentucky Derby, but without the betting. Theoretically, it is a non-competitive game, but kids can always find a way to compete. Playing games is a wonderful way to teach a child so many skills, not the least of which is, “How to be a good winner/loser.” We went over that lesson, and then I took note of the behavior of the children. Do they have their colors down? (Yes!) Can they play by the rules? Do they take turns nicely? Does anybody try to cheat? 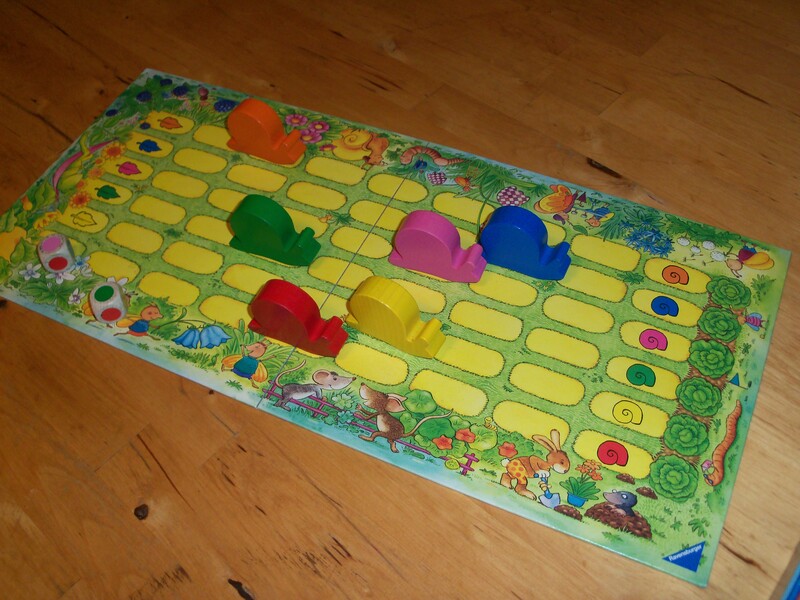 The kids took turns rolling the color dice and moving the snails and we all cheered for each snail as it crossed the finish line. Stones kept our balloons anchored until we were ready to do our experimenting with them. 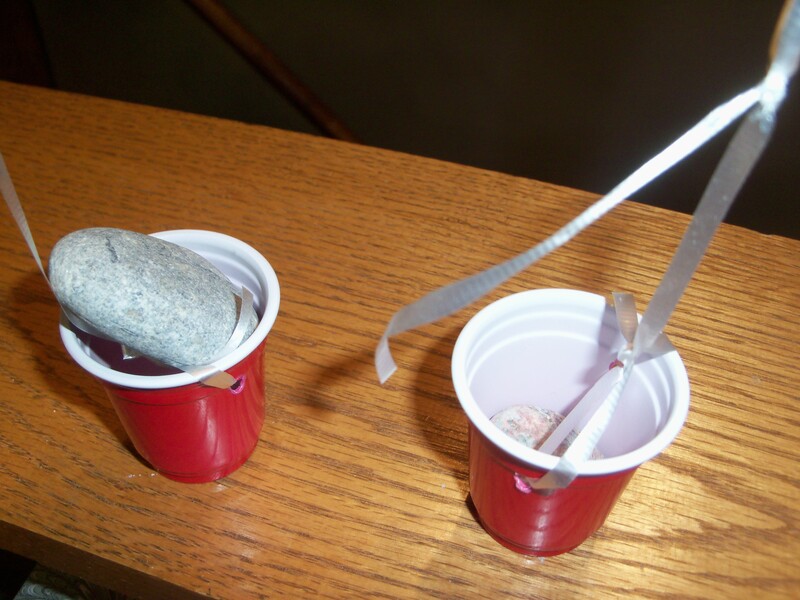 The night before, I’d weighted the Mylar balloons by tying them to tiny Solo cup “shot glasses” which I’d melted holes into by using an ice pick which I’d heated up by holding it over the flame of the stove. Just as I’d hoped, the shot glasses were not enough weight to hold the balloons down, so I added a stone to each cup to keep the balloons weighted. Back to our school time — I had the children remove the stones from their cups and we spent several minutes delighting in letting the balloons go and trying to catch them before they got away. Then I laid an assortment of small items out on the table — toothpicks, Q-Tips, little Lego people, hairbands, tiny pom pom balls, fish and teddy bear counters. I challenged the students to experiment with what it took to keep their cup down. We found about 4 toothpicks was enough for one boy. Another discovered that if he put two pom poms in, the balloon sort of floated mid-air. Some kids had fun just seeing how full they could stuff their cups with all the trinkets. One little bear made this balloon kind of jump around. It took two to anchor it securely. With no added weight, the balloon would float to the ceiling. With just the right amount of added weight you could get it to hover. We folded baby wipes then painted designs on the top layer, and reinforced the design by adding extra paint where needed on the bottom layer. Unfolding brought squeals of delight. 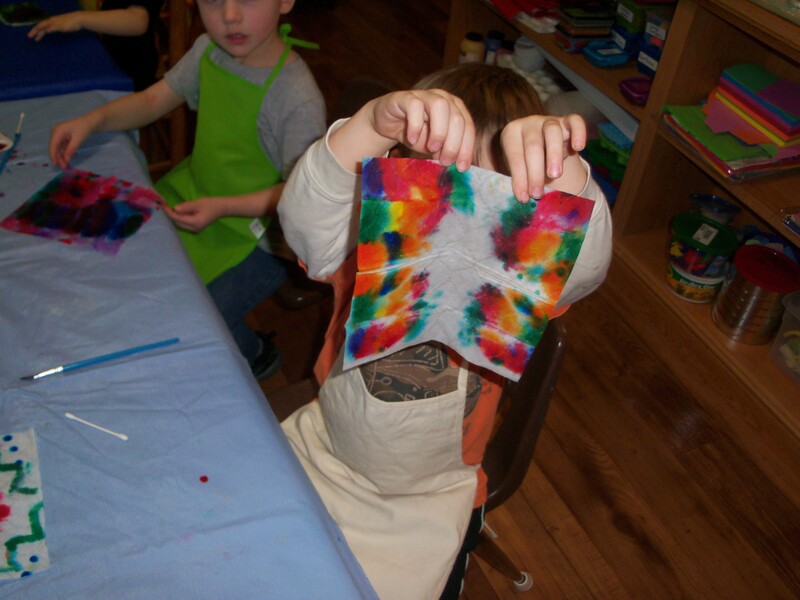 For our art project, we made “tie-dyed” squares. I got the idea here. We found it much easier for 4-year-old hands to just fold the baby wipe into quarters rather than twisting and wrapping rubber bands around them. 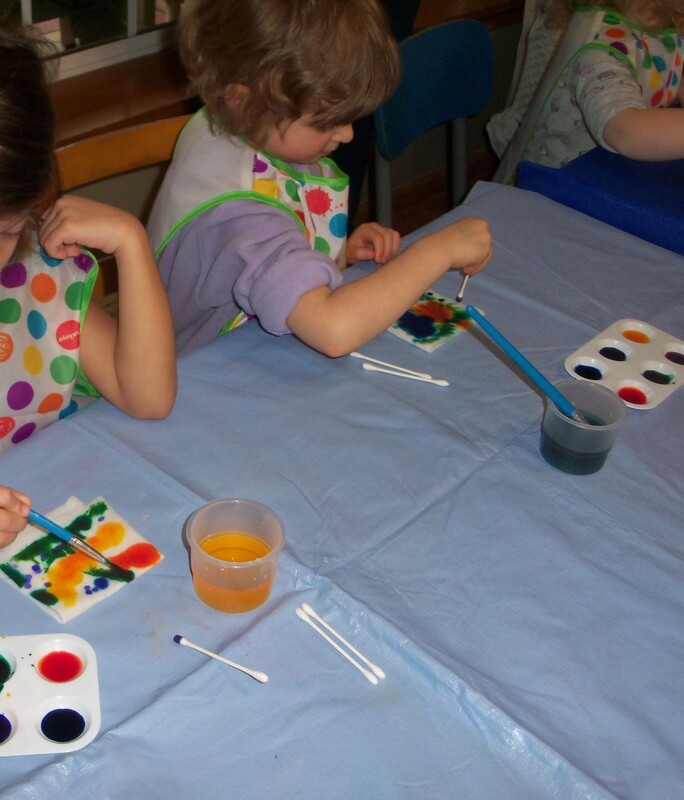 We painted them with these wonderful liquid watercolors. While this meant we had to turn our folded wipe over and reapply some of the colors to the backside, I think the results were just as satisfying. Snack time was another learning experience. Besides apple slices, we gave the children graham crackers and a little pot of peanut butter and instructed them how to use their plastic knife to spread the peanut butter. Next they were offered mini chocolate chips, chopped pecans and coconut flakes to sprinkle on top. Some had never tried coconut before but found they liked it. This led to a conversation about how even though new experiences (like trying coconut or coming to the first day of preschool) might seem a little scary, if we are always afraid to try new things, we will miss out on so much in life. Our group game involved sitting around in a circle on the floor and taking turns rolling a ball across the circle to each other. As we rolled the ball, we had to shout out our name. Simple as this was, the kids anxiously waited for their turns and seemed to really enjoy the activity. Now, the last hour of our day, it was time for free-play. Today’s stations included playing with our tunnel, wooden blocks, rubber animals, stacking cups, this Fisher-Price gumball machine (which, even at 4 years old, these kids can’t seem to get enough of), throwing sock balls to try to hit a Mylar balloon tied to a chair, and a story time corner. We also brought the wooden puzzles back out for those who didn’t get enough of them earlier in the day. All play stations got lots of activity. 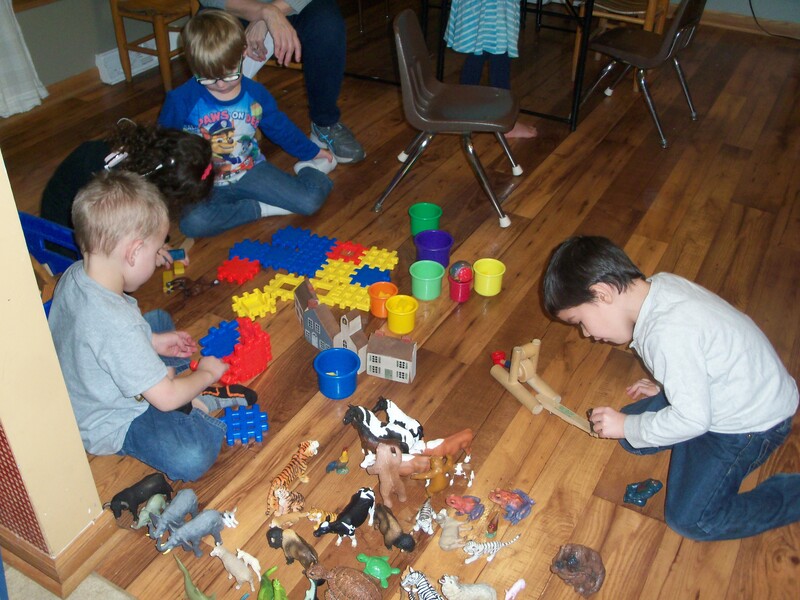 Free play is a vital part of the preschool experience. After spending over two hours in the classroom following directions and mostly staying seated, these kids need time to roam and explore. It’s a wonderful social experience where kids learn to take turns, share toys, cooperate, create and, in some cases, stand in line. … and let it spring up over their heads! The wooden puzzles were brought back out. Blocks, animals and cups? The possibilities are endless. 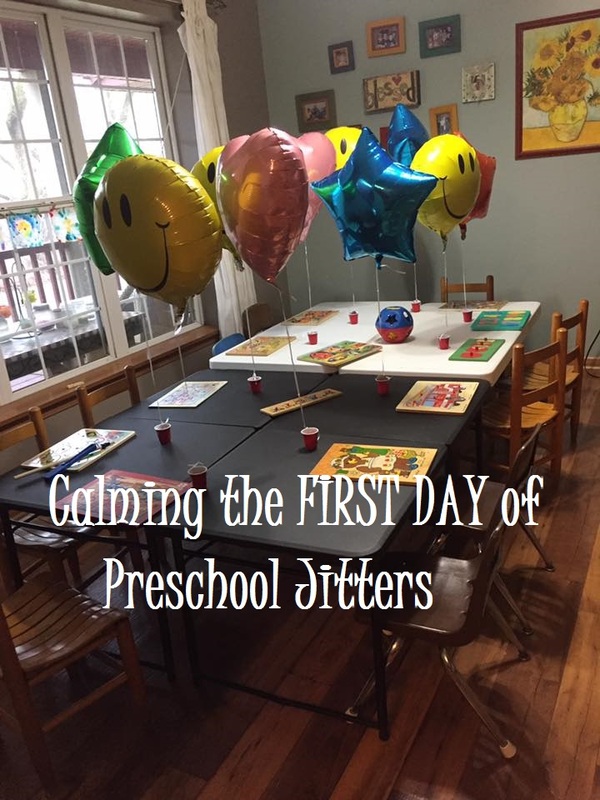 When the parents showed up to pick up their “experienced” preschoolers, they were met with happy faces and chattering children anxious to share about their day. In order to enhance this communication between parents and children, I send home a take-home letter listing all that we did that day and post pictures to our private group page.